The New York Public Library has a great exhibit dedicated to Federico Garcia Lorca. The big surprise for me was that Lorca's very own guitar was in one of the display cases. Photography was not permitted, and there are no photos of the instrument to be found on line (shame on me for not writing down the name of the maker). There is, however, a terrific film about Lorca uploaded to YouTube by Gottfried Geist. A little after the 3-minute mark of this segment, there's a recording of Lorca playing the piano. In another segment (I believe it's the second segment), Lorca's brother talks about Federico having such bad penmanship as a child that he had to take the class multiple times. Here's a link to all the segments of the film. "No one looks at a flower, really. One hasn't time." Michael and I usually spend our trips to cities in art museums. We spend a lot of time looking at the world of the past and the present from the perspective of others. Our experience at the Peabody Museum on the campus of Harvard University in Cambridge, Massachusetts was quite different, because the exhibits (many of them unchanged since my last visit on an elementary school trip) do not interpret the cultures they present. They offer beautifully arrayed artifacts, and you (or I) are invited to learn something about the experience of the people who used them. It is a pretty self-directed museum experience, and one that can change from visit to visit. I found myself comparing fish hooks used by people oceans and centuries apart, and marveled at the fact that people who would never have had any sort of contact with one another managed to figure out how to weave reeds and cloth into baskets and clothes. 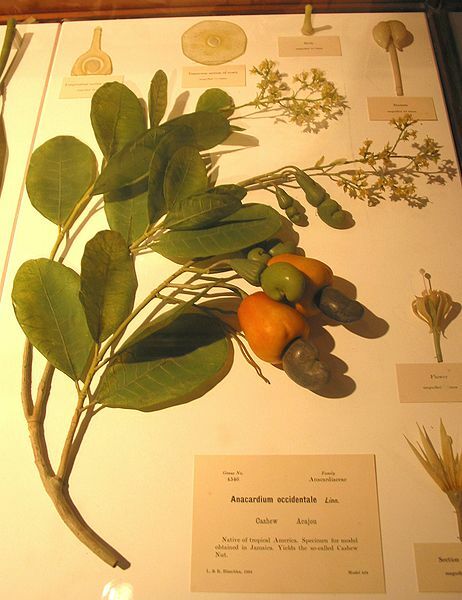 We also experienced the marvelous mixture of sculpture and botanical illustration that allows us to learn more about the natural world than the natural world will allow us in real time. As Georgia O'Keefe once said, "No one looks at a flower, really. One hasn't time." I don't remember seeing the Glass Flowers when I was a child. It's really hard to believe they are made of glass because they look exactly like the flowers that line the sides of roads in summer. The flowers are three-dimensional botanical illustrations that invite you to compare not only the stems, roots, petals, reproductive parts, fruit, and leaves of the flowers, but they let you see what a cross section of a seed or stem looks like when viewed under a microscope. I only recently learned about the way a cashew grows, and was trilled to be able to see it in three dimensions. This photograph (from the Wikipedia article about the Glass Flowers) doesn't really do justice to the real thing because it turns a three-dimensional sculpture into a two-dimensional image. Somehow the only things that made it into our camera were the descriptive cards that accompanied the flowers. You can find more images here, and read an excellent article about the Glass Flowers here. Most of our experiences in Boston and New York last week involved interaction with people (people we knew, and people we didn't know who happened to share a sidewalk with us or an awning in a rainstorm). We both found that kind of lively and living interaction extremely meaningful. It took us a few days to come back to earth (including the one day to took to drive back to Illinois). My walking route is full gardens of real flowers. I experience them differently now. Unlike the Glass Flowers, I can touch the real ones. I can look inside their petals. I know that they won't last more than a day or two, but I can experience their beauty while it's there. Though it really has nothing to do with the substance of this post, I was struck by a statement made by the Headman of Cabrua in 1953 to the anthropologists Robert and Yolanda Murphy that was displayed in the museum. Before you came to live with us, our lives were as always, and we were happy. We worked, we ate, and then we slept. When you came we were glad, for you brought us many fine gifts. And every night, instead of going to sleep, we sat with you, drank coffee, smoked your tobacco, and listened to you radio. But now you go, and we are sorry, for all of these things go with you. We now know pleasures to which we were accustomed, and we shall be unhappy. Michael and I have learned to take the pleasures we find with us, and we both feel fortunate to be able to share them in the blogosphere. There may be two images and two banjo voices, but there's only one Ben! Michael and I just returned from a vacation in Boston and New York. Most people go on vacation to get away from stimulation and stress, but since our lives are kind of topsy-turvy when it comes to matters of stimulation, we pack the most stimulation possible into our forays into the non-bucolic world, and use the rest of the year to recover, react, reflect, and remark. Our three-day visit to New York was basically unstructured. 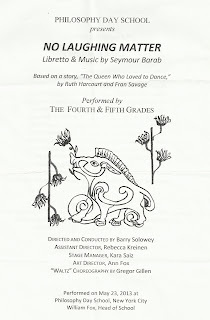 While visiting with our friends Seymour and Margie Barab on Wednesday, we learned that on Thursday afternoon there would be a performance of Seymour's No Laughing Matter at the Philosophy Day School, an elementary school in the neighborhood. I hadn't yet had the opportunity to see one of Seymour's shows for children performed live, so we planned our mostly pedestrian sweep of the city on Thursday to end at 12 East 79th Street. The building, which sits slightly west of the Ukrainian Institute of America, is a beautiful mansion. It houses the School of Practical Philosophy, which operates a Charter School. The school began in 1994, and, unfortunately is closing this year. This performance of No Laughing Matter was its last production. The beautiful white dresses with little blue flowers worn by the girls in the lower grades (as their uniform) is exclusive to the school (you can see it in their Mission and Philosophy page), and on their page about the lower school. Superficial beauty aside, these were truly beautiful kids. There is something special about children who have the opportunity to get an education that equates the importance of the pursuit of knowledge with the pursuit of wisdom. It is very sad that this school has to close its doors. It was a true honor to have the opportunity to visit. These fourth and fifth graders of the Philosophy Day School, many who have been singing together every morning as part of their school day since they were toddlers, had the opportunity to perform No Laughing Matter for the very-much alive 92-year-old composer, his family, friends (that would be us), some parents, the faculty, and the children of the lower school. Their usual repertoire is by the centuries-dead William Shakespeare, and they dove into Barab's work with the same integrity, seriousness, and humor that they would apply Shakespeare's comedies. These were not kids being cute. These were kids being actors. These were kids having fun working together. The voices were beautiful. The acting was superior. Their voices projected when they spoke without the need for any amplification. 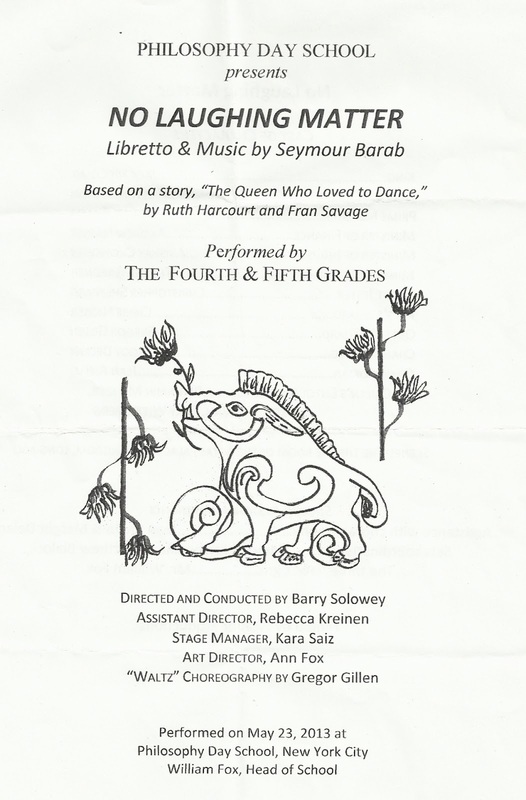 Their understanding of the play was complete (Seymour Barab has a wonderful way of writing both words and music that children of all levels of sophistication can understand and enjoy). My only criticism was that they students, wanting the show to move at the proper pace, didn't always leave enough time for the laughter and applause of the audience. We had to stop applauding sooner than we would have liked in order to hear all the words. What a thrill it is to hear Tamara Volskaya (and the rest of the Abaca String Band) play this piece! In 1980 I came across a reprint of a volume of Jacob van Eyck's Der Fluyten Lust-hof in the Joseph Patelson Music House in New York. I was preparing to leave town (and country) with my modern flute and piccolo, and had really no idea where I was going after the six weeks I was planning to spend in an orchestra in Graz, Austria and an international flute competition I was attending in Budapest. I had only recently been introduced to the idea of jazz improvisation, and I thought that this little book might be a good way to learn to improvise in an idiom other than the Jazz idiom (which seemed terribly complicated to me at the time). 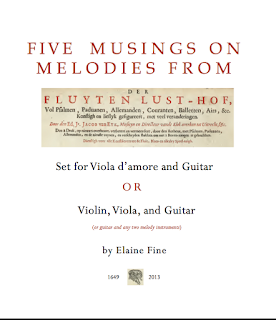 I had no idea that there was a centuries-long tradition of "dividing" popular melodies, so I though that this book, which was actually something quite old, was something quite new. Wouldn't you know it. I got a teaching position in a music school in the little town of Schladming, Austria where a large part of my job was to teach recorder. I hadn't played recorder since I was five or six, so I had to start from scratch with the little soprano Moeck that I found in the drawer of the desk in my studio. I spent the week before the beginning of the school year going through Der Fluyten Lust-hof, and I fell in love with the instrument and the music. These are five of my favorite melodies from the collection. When I first got my viola d'amore, I tried these pieces out on the instrument. The divisions (all the melodies are divided) are rough, but the melodies are as rewarding to play on the viola d'amore as they are on the recorder. 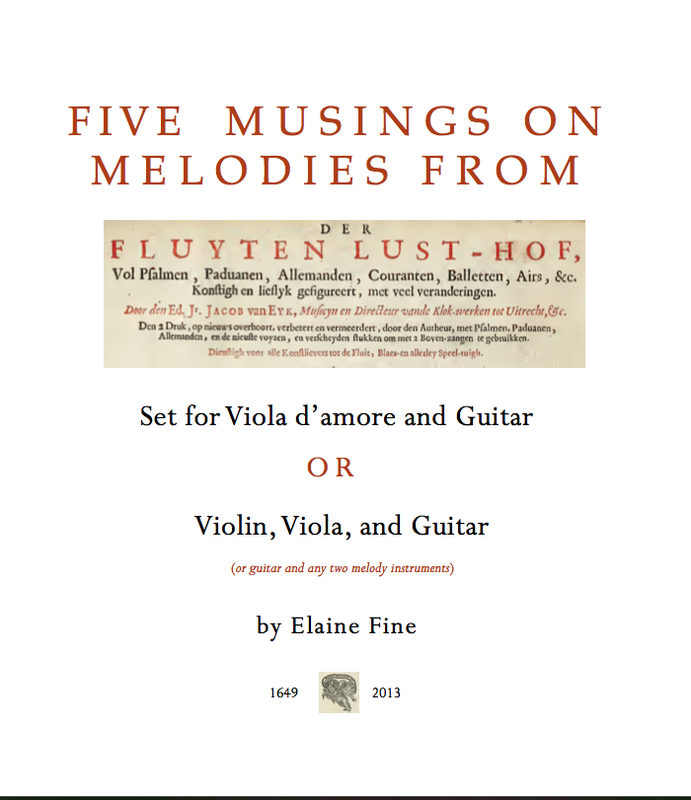 Here's a link to a PDF of the above piece, and here's a link to the original set of publications from 1644-1656. In some ways I wish I didn't enjoy this animation of the Rite of Spring by Stephen Malinowski so much. The music is all synthetically generated using sounds from the Vienna Symphonic Library. All the rhythms, dynamics, and pitches are almost perfect (in the comments an astute trombone player noted a mistake). There is even a believable violin glissando. There are only a few places where the lack of human imperfection sabotages the excitement (particularly eight minutes into the second part, where all of a sudden everything sounds robotic). The animation, however, is remarkable. Watching the video is a fine lesson in orchestration. Stephen Malinowski can't do his animations without getting permission for the recordings he uses. Permission costs money. Technological tools (which are expensive) cost less money than licenses. Making excellent electronic scores takes a large amount of skill, but it is a different kind of skill set from the skill set that most real-time (as in 20 or 30 years of experience) musicians have. What used to be considered a helpful tool for composers has become a viable option for replacing professional musicians in all sorts of ways. I can't really see any greater good coming from all this. Sometimes I fear that the way things are going, we might be looking at a plausible future of large-scale orchestral music. I find this sad. Terribly, terribly sad. There is really no way that I can write an unbiased review of Martin Perry's brand new recording on Bridge of the Charles Ives "Concord" Sonata and three of Gordon Binkerd's Essays for the Piano (the first recordings of these pieces), so I will let my biases fly and ramble. The Ives "Concord" Sonata is a work of time and place for me. I spent a good part of my last year in high school listening to John Kirkpatrick's recording, and reading Essays Before A Sonata. It was at Martin Perry's apartment in New York in the early 1980s (he now lives in Maine) that I first met a live person who actually played the "Concord" Sonata (it was Stephen Drury). 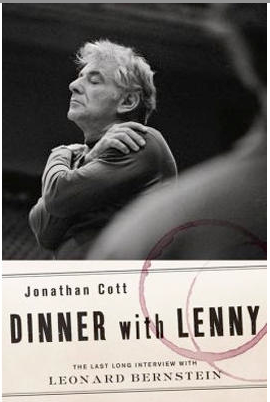 It was also in Marty's apartment that I first read Proust and made the immediate connection with the Saint-Saens D minor Violin Sonata, a piece that I played with Marty back in my days as a flutist who really wished she were a violinist (and I'm living proof that wishes like that can come true). I was thrilled to hear that Marty made a recording of the piece on the excellent Bridge label, and I just finished listening to it. The Ives is music of place for me (since I grew up outside of Boston, and had significant events happen at Walden Pond), and it turns out that the Binkerd is also music of place. 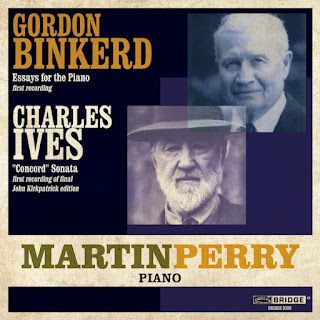 Gordon Binkerd (1916-2003) spent his career teaching composition at the University of Illinois (50 miles up the road from me), and these three piano pieces sparkle with the prairie landscape that I have grown to love. Marty has never been to this part of the country, but he does a really good job of picking up Binkerd's clues and making it aurally recognizable. The connection to the Ives "Concord" Sonata is unmistakable. Drew Massey's notes mention that Binkerd's Essays were published in 1976. That happened to be the year I spent obsessed with Ives. Who knew that I would meet Martin Perry at Juilliard the following year, and who knew that I would move to Binkerd's Illinois in 1985? Binkerd retired from teaching in 1971, but he stuck around here for the rest of his life. I could have seen him in the grocery store, in the library, or even at a concert. All these highly personal coincidences are wrapped up in this remarkable recording. I said earlier that I cannot be unbiased, so it is with a great deal of bias that I tell you that this is extremely thoughtful and extremely beautiful playing. Marty is a person of serious musical intelligence, and he uses it to bring out all the cyclic material in the "Concord" Sonata in a way that provides a strong structure for the piece. All the musical thoughts have their places. He allows for great amounts of exuberance in the exuberant parts, and extraordinarily touching introspection in the introspective parts. Listening is a rather cathartic experience, and an experience that helps put some of the craziness of the world into perspective for me, if only by presenting a world of pure feeling, pure sound, and a bunch of nostalgia in such a clean and fresh package. There is French narration for about a minute and a half into the first segment, but then it's just pure Bartok. Last night I heard an interview show on the radio that featured some of the members of Brooklyn Rider. The point of the show was to introduce this particular string quartet as a group of musicians who are saving classical music because they are making it appealing to young people. The host was gushing away about how much he loved the way they were revitalizing music, and how the music they played transformed him. He went on and on. The musicians went on and on also, answering telephone calls from people young and old who echoed the feelings of the interviewer. There were planted questions (or at least they sounded planted) asking about their relationships with people on college campuses, and asking them to describe the responses of the audiences they played for during their recent Asian tour. These people do have excellent technique, and they can move around their instruments at great speeds, and with great precision. In addition to some of their modal improvisations (inspired by Mediterranean and Balkan traditional music), the host played a bit of a slow movement from Brooklyn Rider's recording of Beethoven Opus 131. It was played without vibrato, and very well in tune. The musicians played it without the usual long-lined phrasing that string quartet musicians spend a lifetime (or four) trying to deliver to audiences and to one another. It was as dull. Is the way to engage the hearts of young people to look counter cultural (dress like a hipster) and play Beethoven without trying to make long phrases and give color to the sound? Is the trick to bore them? Then there was a bit about Bartok, and the host went on and on about how this music was so new. I love Bartok, particularly his string quartets, but his Second String Quartet (that's the one they sampled in the show) is almost 100 years old. Yes, like Haydn, Bartok will always be "new" in spirit, but it's still the new music of the Brooklyn Riders' grandfathers and great-grandfathers. 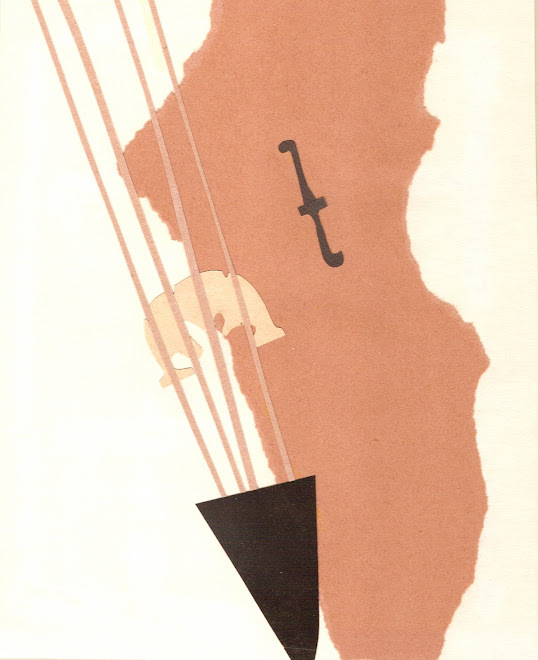 Perhaps the worst part of the show was the discussion they had about Bartok's visit to Nigeria, and how it affected the rhythms in his music. Bartok did travel to Tangier in 1906 and in 1913. Tangier is in Morocco, and was a hot vacation spot during the first decades of the 20th century; but the mix of cultures there would have been totally different from anything you would find in Nigeria. Bartok would have had no reason to travel to Nigeria. I can understand how a non-musical radio host might mix up Tangier and Nigeria, since both are on the continent of Africa; but the musicians should have known better. I would have not written this post if one of the musicians simply said, "I think you mean Tangier." Our son Ben is playing (and beat-boxing) an improvisation with a marxolin player. What a nifty instrument! 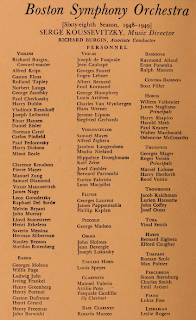 The BSO musicians here I remember from my days as a young person in Boston are Alfred Krips, Rolland Tapley, George Zazofsky, Clarence Knudson, Stanley Benson, and Sheldon Rotenberg; violists Eugen Lehner, George Humphrey, and Jerome Lipson; cellist Alfred Zighera; flutist James Pappoutsakis, oboist John Homes, English horn player Louis Speyer, clarinetist Pasquale Cardillo, bassoonist Ernst Panenka, horn players James Stagliano and Harry Shapiro, trumpet player Roger Voisin, harpist Bernard Zighera, and percussionist Charles Smith. I knew them as the elder statesmen of the orchestra. I don't recognize any of the student musicians here aside from Elayne Jones (you can see and hear her playing timpani at 8:34). That sure is some austere Bach at 12:51! I wonder what happened to that two-headed sculpture? Do you recognize anyone? Who is that composer? 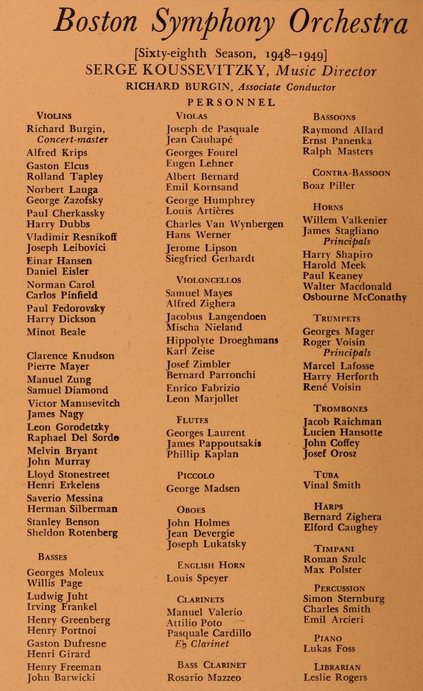 Here's a link to the programs from that 68th Season (1948-1949), which I suppose was Serge Koussevitsky's last season as music director. UPDATE: The oboist is Stevens Hewitt, and the composer-conductor is Jurian Andreason. The piccolo player is Dave Vornholt, the trombonist is John Melick, and the bassoonist is Ben Lepson.